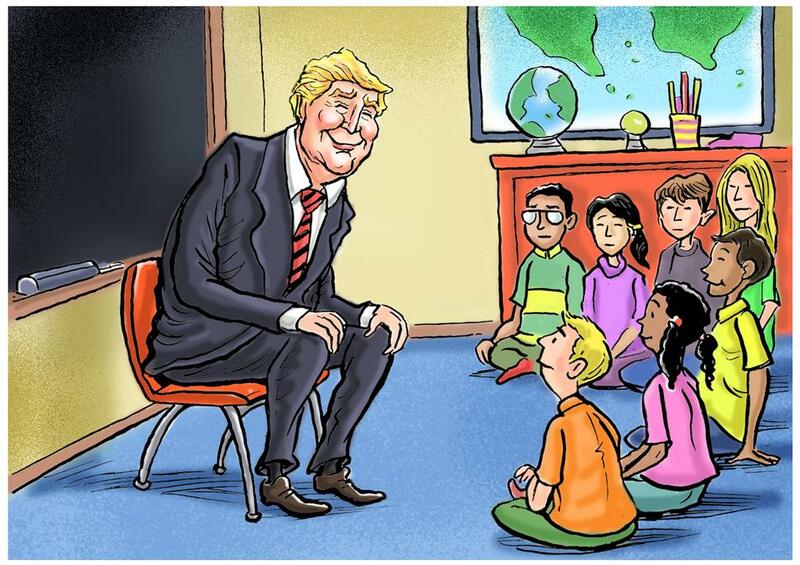 What to Tell Your Children About Trump We are the world’s oldest democracy, we are good people, and we’ve been through shocks before. Eight points and two anecdotes as we continue to digest this astounding election. You don’t know a tree is hollow until you push hard against it and it falls. The establishments of both parties did not know, a year ago, that they were hollow trees. They thought themselves strong because they always had been, and people think what has been true will continue. Then suddenly the tree is pushed and falls. To me that is the symbol, the image of 2016: the hollowed trees and how easily they fell. Election night 2016 was not like 1980. That year produced an outcome fully within the political norms: a former two-term governor won the presidency. This year’s outcome went beyond all previous norms. Twenty-sixteen was like nothing in our lifetimes. In the future people will say, “Where were you that election night?” the way they do for other epochal moments. Much of the mainstream, legacy media continues its self-disgrace. Having failed to kill Donald Trump’s candidacy they will now aim at his transition. Soon they will try to kill his presidency. Any journalists who are judicious toward Trump, who treat him fairly or even as a human being, are now accused of “normalizing” him. This is a manipulation: It is a way of warning your colleagues to approach the president-elect with the proper hostility or be scorned. None of this will do our country any good. The left is in enraged mourning. A better way forward would be: reflect, absorb, gather your strength as the opposition, constructively oppose. Lose the hissing rancor. Use that energy to rebuild your party. Right now 60 million people are very happy, and hopeful. They haven’t taken to the streets in elation, so we can’t see them. They haven’t broken car windows in their joy. Respect their happiness. This is my fear: The question we ask after every national election is, “Can we come together?” The question this year is more, “Do we even want to come together?” Have the two nations within our nation reached a point of permanent estrangement? If the cultural left eases up and the economic right loosens up, maybe things can be soothed. I think many people intuitively sense this: The Trump era either really will work or really won’t. It’s going to be something good or a disaster, but it won’t be a middling thing. This big, burly country can take it either way. The proper attitude now? Give him a chance, watch close, wish well. Cheer what’s sound, criticize what isn’t. He said he’d tell his son that. We warmly shook hands. This isn’t the first story of frightened children I’ve heard since the election. It’s the third. When I told it to a friend, also foreign-born, and so America-loving that he chokes up when he quotes past presidents, he told me that his 5-year-old woke up after the election and sobbed at the news. Mr. Trump’s people seem to me right now proud, exhausted and painfully aware that they emerged victorious despite the daily pummeling from the establishment and elite media. No one gave them a break. And they’re right. It was that way. But it’s not sissy-ish to respect peoples’ anxieties. It doesn’t legitimize your foes’ criticisms to show sensitivity. All presidents since Washington, “the father of our country,” have been seen as a national father figure. It grates on conservatives to think like that. It grates on me. But that’s inevitable for kids who see the president on TV all the time in an un-parented country. They need to see a little gentleness and good intent. Their parents would appreciate it. And it’s needed before the inauguration. Impressions will have hardened by then. I won’t quote exactly what was said. No one put it off the record, but it felt off the record, and some of the conversation was personal. But I can describe it. He was dignified, hilarious and modest. He told me that I’d sometimes been unfair to him, sometimes mean, sometimes really, really mean, but that when I was he usually deserved it, always appreciated it, and keep it up. He spoke of other things; he characterized for me my career. I’d heard of his charm offensive, but I’d be lying if I didn’t say how charming, funny and frank he was—and, as I say, how modest. How actually humble. It moved me. And it hurt to a degree a few weeks later when I wrote in this space that “Sane Donald Trump” would win in a landslide but that the one we had long seen, the crazed, shallow one, wouldn’t, and didn’t deserve to. Is it possible there are deeper reserves of humility, modesty and good intent lurking around in there than we know? And maybe a toolbox, too, that can screw those things together and produce something good? Where there’s life, there’s hope. He’s lively. Let’s hope. But whatever happens, trust America. She has a way of weathering through.